[Server Analytics] is a full set of server statistics, collected constantly, and available for real time analysis as well as historical reporting. Answer innumerable questions about what the server is doing and how it’s resources are deployed. We can see problems coming before the arrive. When we connect your server to the Analytics system, a wealth of information opens up immediately. Hundreds of datapoints collected multiple times a minute means it doesn’t miss anything. 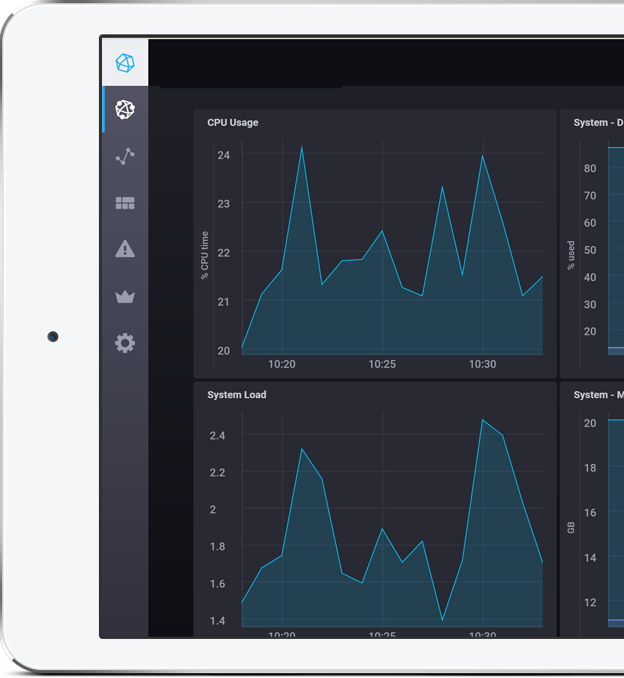 Server Insights enables real time visibility, for monitoring, analysis, and alerting. And with fast and efficient archiving, accessing data from any point in time is just as easy as 10 minutes ago. Whether checking on current operational status or performing a forensic analysis of a historical server event, Server Insights provides unparalled access to data in a package that “just works”. Server Insights isn’t your average monitoring package. It is an integrated solution to many problems that usually require multiple products to address. Server Insights tracks individual service status along with it’s extensive metrics collection. So if mail services decide to take a break, the system knows immediately. As soon as Server Insights is enabled, a large set of base statistics start flowing into the system. Load, CPU, IO, memory, and disk are just a few. Server insights has the ability to connect to a long list of custom data sources. All sources tie into history, reporting, and alerting. Not all alerting systems were created equal. Server Insights provides granular, configurable, and highly accurate alerting based on any of it’s 100s of collected values. Server Insights enables the next generation of alerts. With statistics gathered every few seconds and the ability to trigger off of changes or trends, there’s never been a faster or more flexible way to stay on top of issues. In fact, we’re often able to head off problems before they even become problems. It’s not unusual for our incident response team to mobilize and fix an issue before a customer even notices. Whether your services are managed by our experienced staff or your own team in house, Server Insights gives you the information you need to make better decisions. It also triggers notifications immediately when anything starts to slide. With any of our managed server products, alerts from Server Insights are routed directly to the incident response team. In fact, if a blip comes down the pipe on your server the entire on-duty staff is notified immediately. Faster alerts mean faster resolution, and that spells better uptime for you. Server Insights works with self-managed servers, too. We’ll connect your account to your preferred notification channel – email, text, or other integration options. Let us customize your alerting to make your team’s job of managing the server easier than ever.